In September, my husband and I decided to visit Bluefields Bay, Jamaica to celebrate our 10th Anniversary. It was the first time since our honeymoon that we’d taken a trip alone. From the second we arrived at Bluefields Villas we wondered why we had waited all those years to get away. While we were enjoying our 2nd honeymoon we were reading through some of the information about local activities. The Pack for a Purpose program was listed as a local community outreach. The Bluefield’s family is dedicated to their local community and we learned from the staff that they were teamed up with Pack for A Purpose to help the local basic school. We had such a wonderful time in September by ourselves, but we were feeling very guilty about not taking our children with us…..AND, we realized that we had never taken a trip with just the 4 of us. In the past, we’d always traveled with other families and friends. 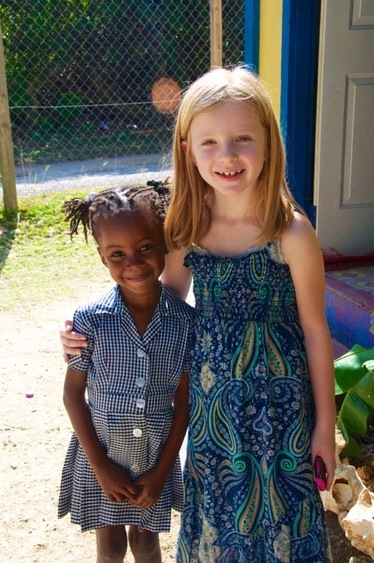 We asked our kids where they would like to go and without hesitation they both wanted to see Jamaica. So within 6 months of our original trip I was making reservations yet again to stay in Bluefields Bay. We have traveled extensively with our children since they were babies, but this would be the first trip that they were mature enough to understand and learn about another culture. What a perfect introduction, the Jamaican people are so full of life. 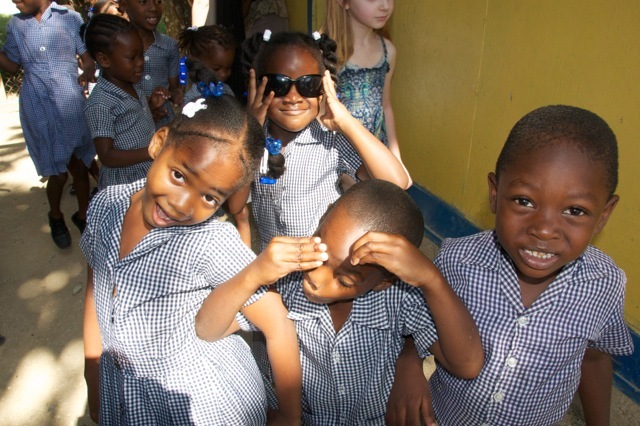 But we didn’t just want them to meet the wonderful staff at Bluefields Villas, we wanted them to see how children their own age live and go to school in other countries. 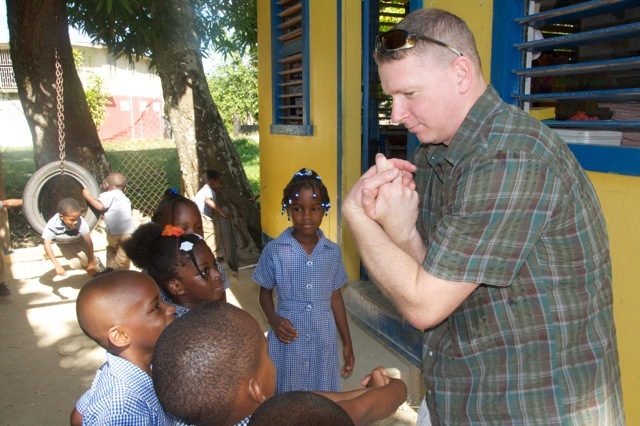 I immediately jumped online and pulled up the Pack for a Purpose website and found the information regarding the Bluefields Basic School. I then notified Bluefields’ Villas that we were intending on visiting the basic school for a morning and that we’d be delivering supplies for the children and teachers. The Pack for a Purpose website was up-to-date with all of the school’s needs. Within an hour, I had gone online and ordered almost everything on the supply list. (Free shipping included!) This was easier and more fulfilling than any Christmas shopping I had ever done. A few days later, the big brown box arrived and my kids were so excited to help me transport everything into an empty suitcase for our trip. By this time, they had already told all of their friends and teachers about their special project. Departure day arrived and to our surprise and delight the airline took a look at our paperwork that I’d printed about Pack for a Purpose and they were gracious enough to compensate us for the cost of the extra baggage! THAT is truly unheard of, in my opinion. But, special thank you to Air Tran Airways for being a charitable partner in our journey. We had 5 amazing days soaking up the sun and visiting local sites. Took a hike through the mountains that included lessons on the beautiful Jamaican foliage and plant life. 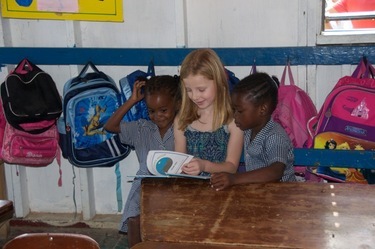 But, by far, the highlight of our trip was on the 6th day, when we visited our new friends at the Basic School and delivered that big red suitcase full of books and toys. From the moment we arrived, our family was surrounded by precious smiling faces. I’ll bet each and every one of those children gave us a hug. They were so appreciative and so full of spirit. A 3 year-old girl got up from her chair and came over to me with tears in her eyes. I asked her Why are you crying, sweetie? And she said, because I know you brought us gifts and it makes me happy! The lessons our own children learned that day cannot be counted. I feel so blessed to have shown them what it means to be sensitive and accepting of others, to share and show compassion NOT pity and to witness true, heartfelt graciousness. We came back to our little corner of the world wanting to share our experience with others. AND, very anxious for the opportunity to do it ALL over again. I can’t thank Pack for a Purpose enough for your amazing work. Even if only for a short time, you connected children from different parts of the world and helped them grow. Little hands, but big hearts!